It’s hard to know when to abandon a project or a bit of infrastructure. Sometimes it is obvious that something isn’t performing as originally intended. Other times, the weather conditions have proven to be too much for the project or bit of infrastructure. And that was certainly the case with the original chicken housing and enclosed run. But before we look at the process of deconstructing the old chicken shed and run, it is worth mentioning that the weather this week has been particularly extreme. The weather has produced little to no rain and the daytime temperatures have changed from very hot one day to quite cold the next day. Some of those changes in maximum daytime temperatures have been as much as a 20’C degree difference. I have decided to repurpose the old chicken shed as a second firewood shed, however the old attached chicken run has to go! Deconstructing the old chicken run continued this week and my main aim with deconstructing this project was to recover as many of the materials as possible for use in other future projects. 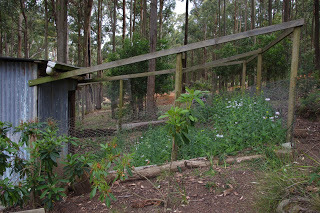 Observant readers will notice that the old chicken run was seriously over engineered as there were two layers of thick gauge steel chicken wire running all of the way around the chicken run. There was also a plinth of fibre cement sheet with logs in front of those. The whole lot was held in place by hundreds of very solid nails. And I spent hours regretfully removing all of those nails this week. The funny thing was, that whilst I was worrying about the dogs and foxes impact on the chickens, I was completely oblivious to the unexpected problem of rats and mice, which as regular readers would now know, completely overwhelmed the old chicken shed and run’s defences. There were a whole lot of fat, happy and relaxed rats in that old chicken shed enjoying the chicken food and water. Anyway, all of that over engineering had to be removed from old chicken run before I could commence any work on converting the old chicken shed into a brand new (well, almost brand new) fire wood shed. The process of removing the over engineering around the chicken run took well over a day, but was eventually done. It is worth noting that there is now a pile of materials messily lying about the place just waiting to be properly and neatly stored in an all-weather material storage bay, but that is the next project in the long list of things to do here at the farm! 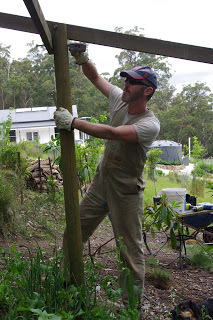 Eventually the two layers of chicken wire were removed from around the chicken run and I was then able to start deconstructing the timber structure that held up the steel mesh roof of the chicken run. The roof beams for the chicken run were secured onto the treated pine posts with large galvanised steel bolts and fortunately they were quite easy to remove and store for later reuse. In the photo above, we can also play the continuing game of “Where’s Toothy?” for those that dare take on the Toothy photo-bomb challenge! 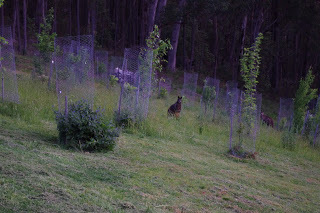 Observant readers would have noticed in the various above photos all of the lush vegetation that has grown in the old chicken run since the chickens were removed to their new chicken run and shed – the “Chooktopia” project from the middle of this year. 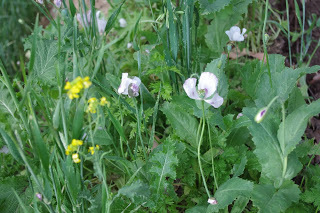 In the close up photo below of all of that lush vegetation, I can spot: poppies; green mustards; wild brassica; carrots; coriander and I’m unsure whether it is either barley or wheat (time will tell). 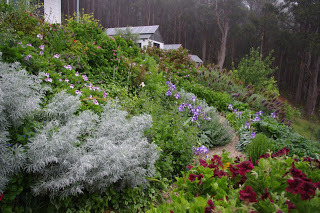 All of these plants have grown without any care, water or attention on my part and it has made me wonder whether I am putting too much effort into the vegetable beds here? 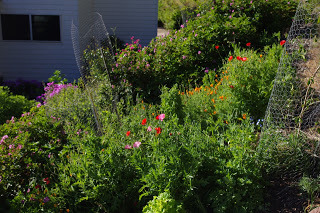 I reckon the poppies may have come from the uneaten poppy seeds from my bread! 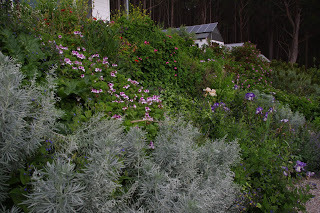 It may be hard to believe, but regular readers may be surprised to know that the hot and dry days at the farm have produced even more flowers this week. On hot days there is so much bee and insect activity over the flowers that the buzz sound is unrelentingly loud. And if you were to put your ear next to the air vents on the larger of the two bee hives you can hear a sound that is not dissimilar to that of a jet aircraft in flight. I may yet add a honey super box to that large bee colony. 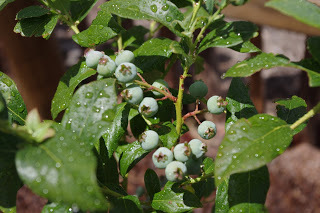 Over the past year or so, I have been experimenting with planting fruit trees into those thickly vegetated garden beds and what has surprised me about that experiment is that despite the very thick vegetation, the fruit trees seem to really do well. In fact, I’d reckon that they grow faster in the thick vegetation and produce more fruit than they do in the open paddock of herbage. 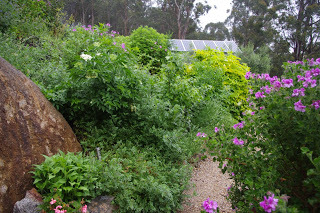 The photo below shows a second year avocado tree enjoying being completely surrounded by rhubarb, carrots, borage, French sorrel, Jerusalem artichokes and geraniums. Tomatoes are a very important, very heavy yielding, but also a very water hungry crop and this week, my gut feeling says that they have finally established themselves in the berry enclosure. I recently purchased a second hand quality electric food dehydrator and I am already envisioning drying a huge crop of tasty tomatoes and storing them in olive oil for consumption over the winter of 2016. Yum! I’ve also been considering planting out the remainder of the tomato seedlings into various garden beds over the next day or so. The recent hot conditions have forced me to commence chopping and dropping the herbage which grows under the two orchards here. 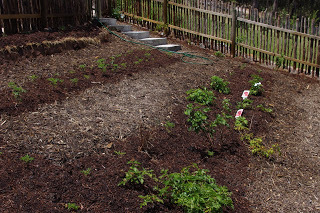 The chopped and dropped herbage provides a cover of mulch over the living herbage and helps reduce evaporation from the soil on very hot days. In the photo above, you can see that most fruit trees have also been given a good feed of manure which increases the resiliency of those fruit trees to stress and keeps the roots of those fruit trees cool on very hot days. You can see that two trees (at the bottom of the photo) have yet to be fed with the manure and in all honesty I have only fed about one quarter of the entire orchard, but will get to the other fruit trees over the next few weeks. One of the fruit trees in the photo above at about the middle left hand side is a pecan nut tree which has tapped into the flows from the worm farm sewage system and I have no doubts that that particular tree will eventually become an absolute monster of a nut tree! Already the young pecan nut tree is surrounded by massive growth of borage plants and eventually it will provide afternoon shade for the rest of that orchard. 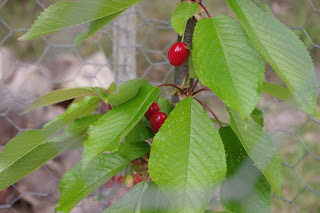 Not to make all of the Northern hemisphere readers jealous, but the cherries have gone from strength to strength over the past few weeks and I noticed this ripe cherry yesterday. I have to now rush out and pick the fruit before the birds (or the editor!) get it. Cherry trees were not given the Latin name Prunus Avium (or alternatively Prunus Emendator!) for nothing! 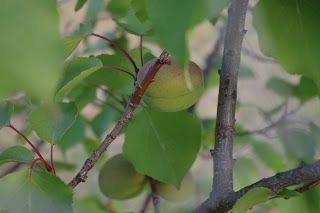 The warmer and drier conditions have also brought the ripening of the apricot fruits and despite the lack of rain or any watering over the past few weeks, the fruit has swelled in size and they have also shown the first signs of blush which is another indicator of impending ripeness. 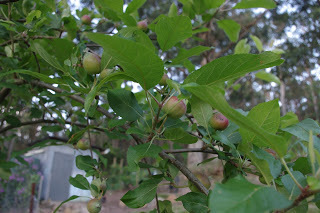 One of the earliest trees that I planted as an experiment in amongst the flower and garden beds was an Anzac peach fruit tree which had been previously struggling. 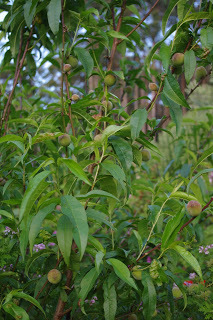 The prolific growth from this one peach tree in its new location has left me wondering whether I am actually providing enough food for the fruit trees here as the growth has been nothing short of amazing. Scritchy the boss dog is acting a bit weird as she always does when there is a thunderstorm anywhere within a hundred kilometres (or more) of the farm. She is a sensitive lady! The thunder and lightning is now cracking over the farm and the heavens have finally opened to deliver some solid rainfall. The air itself smells of moisture, warmth and vegetation and the water tanks are getting a small refill. Tomorrow is the official first day of summer (which in reality began a month ago here) and we are going into summer with about 90% of a total possible stored water capacity of 104,000 litres (27,470 gallons). The temperature outside today reached over 33’C (91.4’F) but with the most excellent storm outside right now, the temperature at about 6.45pm has fallen to 20.8’C degrees Celsius (69.4’F). So far this year there has been 689.4mm (27.1 inches) of rainfall which is up from last week’s total 688.8mm (27.1 inches). I don’t travel much these days, but this week the editor and I hit the road in our trusty Suzuki and travelled to Canberra which is the nation’s capital city. 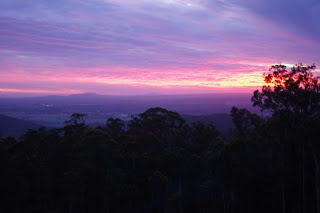 The location of Canberra is a funny place to construct a city, least of all any nation’s capital city, because it is in the middle of nowhere. The road trip took about 9 hours each way (including stops) so it was a big drive. Believe it or not there is no rail access between Melbourne and Canberra either as I would have enjoyed a rail journey. The freeway has only recently bypassed every single town on that long journey making the drive even more boring, so suckers for punishment can simply drive all day long without stopping. I don’t revel in long distance car journeys so we stopped at many of the now bypassed and sleepy towns along the way. I mean how could anyone not want to stop off and check out the Dog on the Tuckerbox memorial?. Or visit the inland town that managed to half bury the HMAS Otway (S 59) Oberon class submarine in its main park as a tourist attraction which you can climb all over? Or what about the disused timber Road and rail bridge over the Murrumbidgee River, New South Wales which is also very impressive. Incidentally, those bridges are the only structure that I have ever seen in this country described as a managed ruin, whatever that means? So we took our time on the journey and visited many out of the way towns and the trip was thus made more enjoyable. For the past seven years I’ve baked bread from scratch most days of the week. However, because of the road trip, I was unable to bake any bread at all, so we stopped off at a random town along the way that had a functioning bakery and picked up a couple of bread rolls to eat for lunch the following day. At lunch the next day, I tucked into the purchased bread roll and recoiled with absolute horror. The roll certainly looked like bread, but I’m pretty certain that it wasn’t like any bread that I make. The bread roll was full of air, dry and tasted like… well, nothing at all! What was this bread-like product that I’d just half consumed? Who knows what it was, but it certainly wasn’t bread from my perspective. I then later recalled a strange incident from about half a year ago when I was gifted a huge bag of commercially baked bread for the chickens to eat. 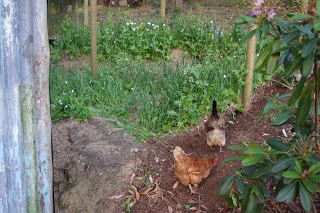 However, both the chickens and the dogs refused to eat that bread and after a few days I had to throw all of the – still soft – but uneaten loaves into the worm farm for composting. Fortunately, the worms are not too fussy and they quickly consumed the bread that nothing else on the farm dared eat! As a confession, I admit that I am notoriously tight with money and am always on the hunt for a bargain. Fortunately for my predilections, there are bargains to be found! However, the editor totally out did me this week as she stumbled across a total bargain of a second hand hardwood table. 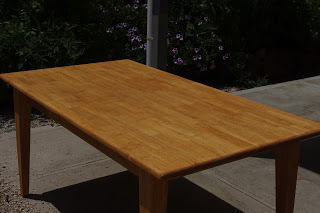 The table was locally made from reclaimed rubber plantation timber which would otherwise have been burnt. 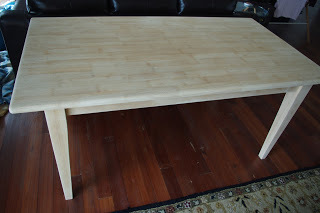 The hardwood table cost less than $33, but was perhaps unappealing for other people because it had been seriously scratched and had been stained in an unusual walnut colour in an acrylic (i.e. plastic) coating. 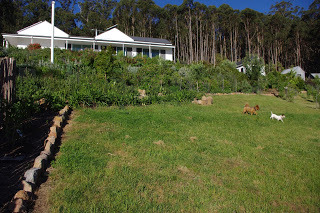 Observant readers will note that Toothy is in the top left hand corner of the photo, supervising the work! It took several hours for the plastic surface coat to be completely removed from the timber table using sand paper, but eventually the job was completed. I find it strange that people coat any timber at all with acrylic (i.e. plastic and water based) coatings as they rarely protect the raw timber. On the other hand oil based coatings usually penetrate the surface and protect the timber. Oil based coatings often have the advantage of highlighting the natural markings in timber and they can produce beautiful rich and complex finishes. 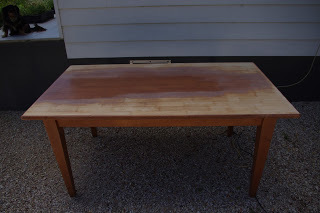 I am writing this entry this evening on that new-to-me second hand table! The strong sunlight has killed many of the tomato seedlings, but even still, a whole lot of them have survived and thrived. As various the tomato seedlings die, I have been replacing them with new seedlings which I still have an abundance of. The first raspberry was picked today and the editor tells me that it was quite tasty for an early raspberry! 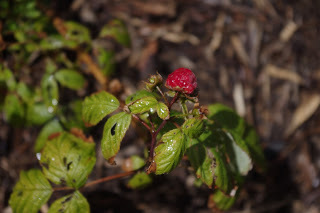 We haven’t had much success with raspberries in previous years because the wallabies ate the entire canes (despite the thorns) and the photo below was the first of any of that fruit here! 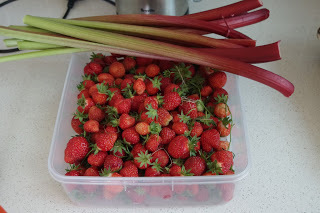 However, the winner is… Strawberries – the first of which ripened this week and for those readers in the now cold Northern Hemisphere, please don’t be too jealous at the photo below which was the first of many strawberry harvests over the next few months! 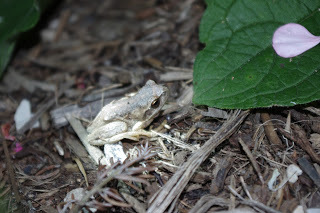 Generally, I’m pretty cool with the wildlife enjoying the benefits of the gardens and orchard at the farm. I’m not cool about deer though, as they have previously stripped the bark off some of my apple trees for no apparent reason at all and so on Saturday evening, I spotted the varmints skulking through the nearby forest about 2km (1.25 miles) from the farm. 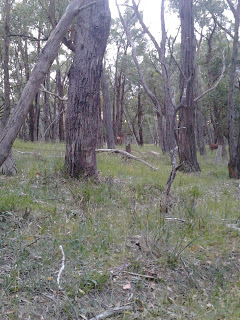 Unfortunately, I only had my phone on me at the time which has a very low resolution camera, but there are at least two deer in the photo below. 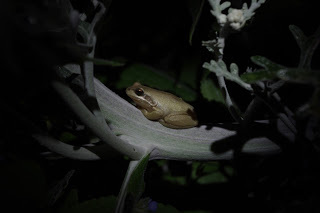 Most of the other wildlife is beneficial to the farm and the frogs perform many useful services for me by consuming all manner of insects that would otherwise be eating my produce and I spotted this little fella a couple of nights back. 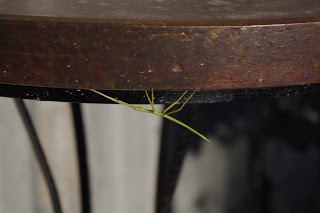 And there are other insect predators which are just downright weird looking and I spotted this bright green stick insect enjoying the protection of a well-oiled Jarrah (a timber from southern Western Australia) round table top. As a fun fact, the steel base for that table was recovered from the local tip shop, whilst the Jarrah top was purchased from an old dude whom sells beautiful hand-made reclaimed timber table tops at the local hippy market. It is a pleasure to see that the stick insect enjoys such excellent craftsmanship! The temperature outside here at about 9.15pm is 10.5’C degrees Celsius (50.9’F). So far this year there has been 688.8mm (27.1 inches) of rainfall which is up from last week’s total 686.0mm (27.0 inches). I’ve been thinking this week about technology. It is good stuff, until it no longer works. On Friday the modem that I use here to connect to the Internet via the 4G mobile phone network blew up! Actually, that is a bit of an exaggeration as the modem didn’t quite blow up, it simply died with a whimper part way through replying to comments. IAM (immediately after modem), I spent an hour and half trying to work out what exactly had gone wrong with the Internet connection. 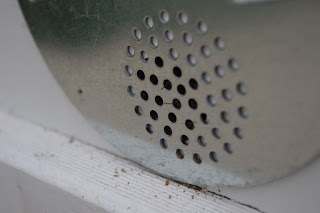 The next day, I spent about the same amount of time on the phone with the helpful people at the telecommunications company who finally determined what I already knew – the modem had unexpectedly died. 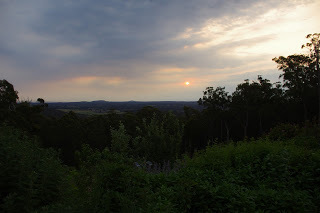 A replacement modem has been organised, however living in a remote spot means that it will take between 3 and 5 business days for the new modem to arrive in the mail at the local General Store. I now suffer from AODMD (acceptance of delayed modem delivery). 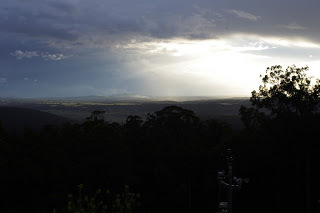 Have I ever mentioned that Australia Post refuses to deliver anything to my house as it is in a remote location (60km from the Melbourne CBD post office – go figure)? In my previous incarnation as a mildly naïve urbanite (otherwise known as a townie) it had never even occurred to me that there were locations that the postal service would not deliver mail to! I’ve adapted to this reality although it sometimes causes difficulties and I now enjoy regaling people with horror stories of living in an official postal black hole (PBH?)! Meanwhile life goes on and the situation with the modem started me thinking about how the infrastructure that we all take for granted every day is actually quite fragile and brittle. And from that thought, the editor and I discussed how we work through the process of deciding upon the extent of time and resources that are given to any particular infrastructure project here. Chase a dream outcome for that project. Gordon Ramsay, the very talented and successful UK chef, was part of a television series a few years ago titled: “Kitchen Nightmares”. As an established chef, Gordon Ramsay was invited into failing restaurant businesses by the owners of those businesses to help them correct many of the apparent failings of those businesses. It is fascinating viewing because Gordon Ramsay dissects some of the problems of the businesses and commences the long and slow process of correcting those problems. It is entertaining too because Gordon Ramsay is a straight talking kind of guy (and a bit sweary). What fascinates me about Gordon Ramsay’s approach is that he utilises the first strategy and quickly reviews the resources in a failing business and then utilises their strengths and works with the weaknesses to achieve a reasonable outcome. I too have utilised this strategy in the world of business and can report that it is very effective. Back to the farm, that first strategy was used to produce the original chicken house and enclosure. Both time and resources were scarce when the original chicken house project was constructed. It was decided by the editor and I to utilise an existing timber frame structure that had a roof over it which was used to collect water for a small water tank providing water to the orchard and for the house construction, as the base structure for the old chicken house and enclosure. However, readers with excellent memories will recall that an entirely new chicken housing structure was constructed from scratch a few months back – which was the Chooktopia project. The first strategy which utilised the resources and infrastructure that we had on hand, turned out to be a temporary solution to the problem of where to house the chickens. This is because it didn’t work very well. 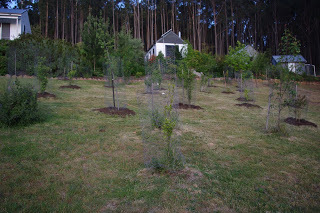 The recently completed Chooktopia project however, displayed the second strategy in action. This meant thinking about what the chickens needs were based on the lessons learned from the previous structure and then working backwards to identify what the new project would look like once completed. And after a few hard weeks of construction, the new project for the chicken housing and run was completed. 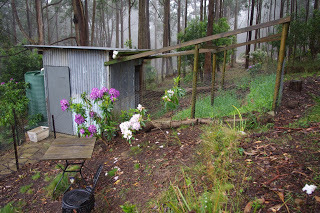 It is a superior chook enclosure. There is virtually no Internet connectivity this week at the farm, so instead of performing a Google search for the definition of the word “Abstract”, I had to go and grab my trusty hardback version of “The Concise Oxford Dictionary” Third Edition dating back to 1934 from the bookshelves! This week is very low tech (and a bit leather bound)! The word “Abstract” is defined in that trusty book (as an adjective): Separated from matter, practice, or particular examples, not concrete; ideal, not practical; abstruse. The third strategy mentioned above of chasing dream outcomes for projects is neatly defined for me above in the word Abstract as: Ideal, not practical. Examples that I can think of are: Dream house, dream wedding, dream holiday, dream chook pen etc (you get the idea). It is useful to note that whilst any ideas that fall into that third strategic category would be nice to have, sadly we usually have to discard those ideas out of hand due to economic constraints. It may be hard for some readers to believe, but there are now even more flowers this week. 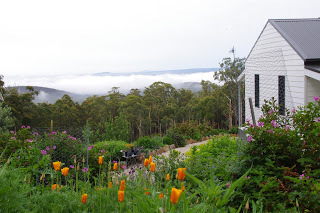 A few years ago, a local beekeeper advised me that I did not have enough food for the bees on the farm, so I took his advice on board and just kept planting more flowers and creating more flower beds. 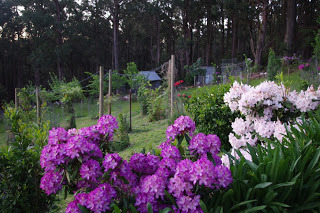 Over the past few years I have been trialling what flowers easily and reliably grow here and so the diversity increases with each year. Observant readers will notice in the photo below that there is a black long haired Dachshund (aka Toothy) stalking through the vegetation. 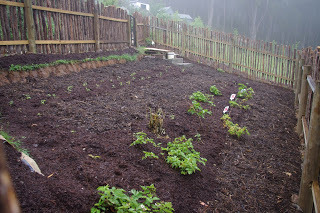 The garden beds are continually increasing in size, and this week I completed the garden bed below the recently constructed fire wood shed. 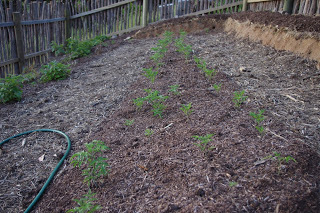 The small green splats in the new garden bed are some of the many tomato seedlings that I have been planting. 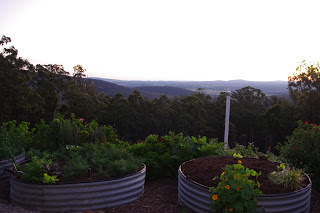 Over the past few years I’ve been experimenting with growing vegetables, herbs, fruit trees and flowers all in a confusing mass of vegetation and the experiments seem to be going well. 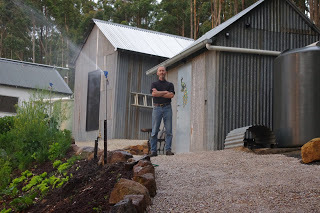 Before that garden bed could be completed, I had to install a pump, tap, water tank overflow and bushfire sprinkler all connected to the 4,000 litre (1,000 gallon) water tank that is fed from rainfall collected from the fire wood shed. The observation window into the new experimental bee hive has been an outstanding success and I’m able to observe what is happening in the new bee colony most days and haven’t yet been stung by the bees! 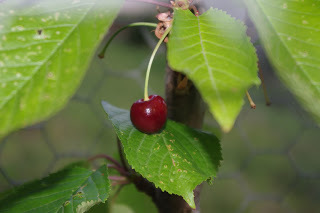 I may have next to no Internet access this week and these few photos took over half an hour to upload, but the editor and I do have the first of the ripe cherries. 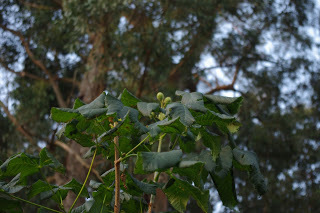 The cherry variety in the photo below is an Early Burlap and we ate those fruits faster than the birds ever could have! The temperature outside here at about 10.15pm is 10.1’C degrees Celsius (50.2’F). So far this year there has been 686.0mm (27.0 inches) of rainfall which is up from last week’s total 682.6mm (26.9 inches). Ah yes, the dodgy days of early 90’s electronic dance music are personified for me in the massive hit from the Belgian dance act Technotronics with their song: Pump Up the Jam (58.5 million YouTube views can’t be wrong). With the benefit of hindsight though, I can recall those days as being a bit of a pain. Seriously! I worked full time and studied at University two nights per week and by the time Thursday, Friday or even Saturday nights rolled around, the last place I wanted to be was at a club gyrating away with dance moves from the Peter Garrett (of Midnight Oil fame) school of dance moves (if you know what I’m talking about, you just know what I mean by that last sentence. Nuff said). By the time the bells of midnight tolled, all I wanted to do was go to bed and sleep the sleep of exhaustion. Sneaking off from friends and heading home to catch some quality sleep became a lifestyle choice for me. The questions from friends less burdened than I with responsibilities were easy to dodge too: Great night man. Yeah, must have lost you lot in the crowd. Fortunately for me, they were usually inebriated so recollection of the details was always a bit fuzzy. The girlfriend was a much tougher customer though. In situations involving late nights and thumping bass beats, ditching the girlfriend as midnight arrived was not an option and that meant unavoidable late nights. 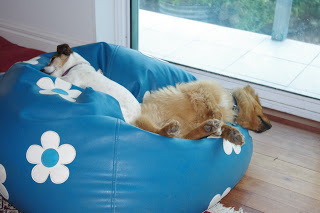 What was generally amazing about those days was that I never once fell asleep at either work or University. It is worth noting that 2 hour long economics lectures can be dreadfully dull and had I gone to sleep, perhaps the lecturer may have enjoyed my feedback on their lecture technique in the form of my gentle snores? The whole fandangle quickly became something of a deal breaker for me. It is instructive that most of the people I still know from those days now live quiet, sedate lives and I doubt very much whether they have the stamina to put in a hard day’s work at the farm here, or to rip up dance floors into the small hours! Why are we discussing this obscure subject? Oh, that’s right, it rained this week. The rain was quite heavy and a small tornado even threatened the outskirts of the nearby city of Melbourne. 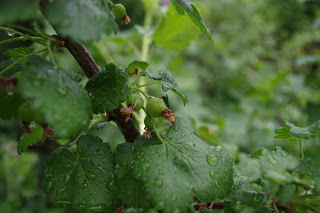 It was an impressive storm and that is generally how a lot of the rainfall falls onto the farm over the summer months. Heavy rainfall can test every single system too as that water carries with it a whole lot of energy. And if that heavy rainfall is delivered in a short period of time, then its destructive force is that much greater. If your infrastructure has been boogying away all night on the dance floor (and thus a bit tired and worn out), that infrastructure is probably a bit vulnerable to damage from system shocks such as heavy rainfall. Most of the infrastructure here handled the heavy rainfall quite well. 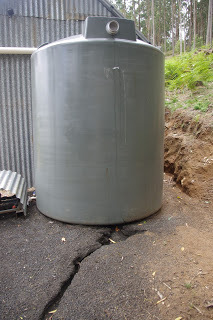 One problem was that the most recently installed water tank (attached to the wood shed) which holds 4,000 litres (1,050 gallons) of water, had not yet had an overflow installed. 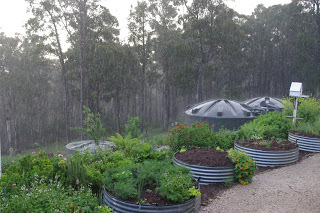 That water tank was already full prior to the heavy rainfall and so the tank simply overflowed onto the ground. The photo above shows that the collected water off the small shed had the power to cut a deep channel into the clay. That was only the water collected from a small wood shed, so imagine just how much water is collected from the very much larger roof space of the house during all of that heavy rain. Thus, adding an overflow to that water tank became a priority over the past few days and I’m glad that the overflow is now installed. 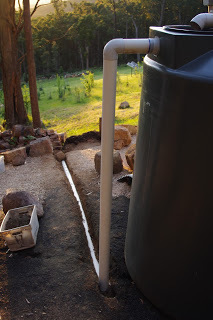 I haven’t yet backfilled soil over the trench with the large white water overflow pipe because over the next week or so I’ll connect up a pump, garden tap and bushfire sprinkler to the water tank, and some of the pipes will run in that trench. The new berry enclosure (for blackberries and blueberries and also temporarily housing the tomatoes) is almost complete and the final concrete stair step into that enclosure received its final finishing touches on the day before the storm arrived. 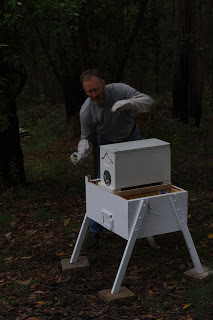 Earlier in the week, I received an email from Robert at his shop: Bee Sustainable in Melbourne letting me know that the ordered bee colony was finally available for pick up (I receive no benefit from mentioning this shop). Bees are sold in a nucleus hive box (which is a fancy name for a small bee box with only five frames rather than the usual eight or ten). The bees are feisty little critters and they were busting to escape the nucleus box and explore the farm. 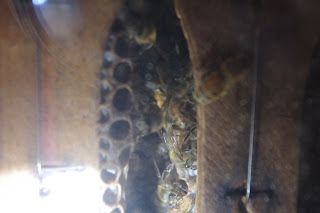 You can see their proboscises protruding out of the air vents on that nucleus hive. It probably goes without saying that it is probably not a wise move to put your hands or fingers too close to that entrance. It was a bit too cold and breezy the day of delivery to transfer the frames across to the recently completed new experimental bee hive. In such a situation you can simply place the nucleus box on top of the experimental bee hive and open the door on the front of the nucleus box and the bees can come and go as they please. 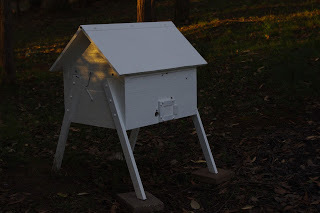 The bees will be fine in the nucleus box for a day or two as you can wait for more appropriate weather to transfer them across to their new hive. As a general rule, the bees don’t like having their entire colony exposed to cool to cold weather. The above photo is an action shot because I had to employ some of those Peter Garrett funky dance moves (edit – if you don’t know what Chris is talking about, check out Peter Garrett Dancing Compilation 125,000 YouTube views can’t be wrong) to quickly spring back and out of the way to avoid being stung by the now very annoyed bees. The next day was warm and still so the whole colony was transferred into their new experimental home. Whilst I was at the bee shop I noticed that they were selling some funky new roofs for bee hives and I splashed out and bought one. The existing bee hive scored that new roof and another (third) box with eight additional frames for them to lay brood in. 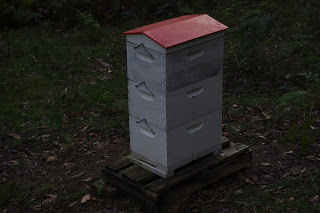 It was a good thing that I replaced the roof as I felt that the original flat roof maintained too much humidity as it was quite damp inside the hive box. As a fun fact, the bees spend a lot of their time and energies maintaining conditions inside the colony so that it is perfect for both storing honey and rearing brood. If the inside of the hive becomes too humid the honey can possibly ferment. Fermented honey is otherwise known as the drink: Mead. I like mead, but unfortunately it is not good for the health of the bees and they can become very sick consuming it. 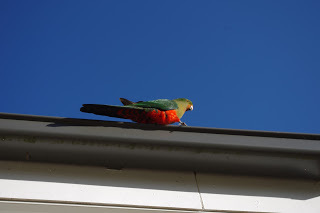 And speaking of funky disco moves, a brand new bird turned up this week at the farm shaking its booty in its rave cave gear for all of us to appreciate: A King Parrot. I have never seen one of these birds in this area before and it amazes me that as the diversity of plant life increases here at the farm, so too does the diversity of bird, insect and animal life. The local marsupials hit the clubs the other evening for a dance off too. Well, it wasn’t really a club, it was actually part of the orchard where a very fat and comfortable looking wallaby faced off against a much smaller and younger kangaroo. 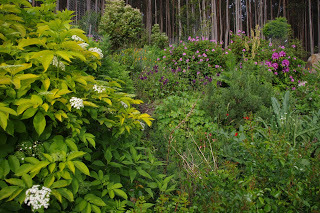 When it comes to the show ponies of the plant world in this mountain range, few plants can compete with the orchids here. 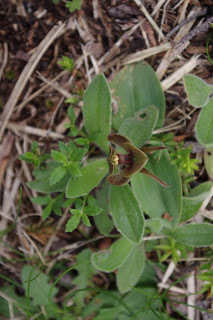 I spotted this spider orchid a few days ago after the heavy rainfall. Please note that the orchid is dressed in a muted colour scheme so that it can nick off at midnight without the other flowers noticing! The temperature outside here at about 1.00pm is 28.2’C degrees Celsius (82.8’F). So far this year there has been 682.6mm (26.9 inches) of rainfall which is up from last week’s total 632.6mm (24.9 inches). Hard times mould and shape the world. You can go to bed one night blissfully unaware of changes in the wind, only to then wake up the next morning and be confronted by an uncaring force moulding and shaping of your personal world. And I use that word “uncaring” in the most literal sense because change can be an impersonal force which sweeps you away from your comfort zone and into a world that looks like a very different world than the day before. I fear that uncaring ghost. I was reminded this week of the sudden turns that life can take because several people asked me why both the editor and I live where we do. It is a good question which I’ve covered before in the blog. 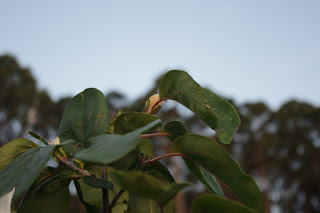 But then one of the farm projects that I was working on this week also provided answers to that question so I thought perhaps this was a topic that was worthwhile exploring again. The poet of Generation X was Kurt Cobain of the famous rock band “Nirvana”. Kurt was like many other troubled poets as he took his own life in 1994. But before his death Kurt wrote the song “Breed” in 1991. I really liked that song, and I must confess that a curious circumstance assisted my enjoyment of that song. The circumstance was that a friend of mine really hated that song. My mate, you see, was very well financed having wealthy parents so he didn’t have to work or study or even try hard. If anything went wrong in his life, no worries, they’d pick up the tab no matter how large. He didn’t have to care, but he could pretend that he did care. I lived in an entirely different world from my friend, where I had to care, but I didn’t actually want to have to care. And the song lyrics spoke directly to my heart. Then in that same year of 1991, in my first job as an adult (I’d worked in all sorts of jobs from about the age of 12), Australia went through the recession that “we had to have” – which is what the government of the time described it as. I came face to face with my ghost because as unemployment reached 10% of the working population, I found myself unemployed. Moving back home was not an option and in between rent, student debt, bills and food I had no savings to speak of. I had scramble to put food on the table and keep a roof over my head, so with no other employment option presenting itself, I took a job in the unusual world of debt collection. I did this for the next four years. Over the course of a few short weeks, I’d awoken from my previous blissful experience to find that the world was a very different place than I thought that it was. The experience was an initiation of sorts and I used that formative experience to motivate me to ensure that I’m not in that circumstance again. Like the song says: I’m afraid of a ghost, well, I was and still am afraid of a ghost, but despite it all, I do actually care. The weather last week has been hovering around 25’C+ (77’F+) most days and the sun has shone strongly. By mid-afternoon the intensity of the sun is such that it feels as if it is biting your skin and serious sunburn is a constant risk. For those that aren’t aware, the October weather easily smashed most heat records across most the continent: Record breaking October Heat. The average temperature for the month of October here was 5’C greater than the long term average! 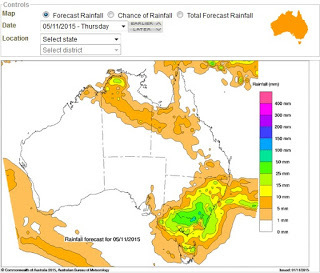 And if the extreme heat wasn’t unusual enough, this coming Thursday a tropical storm is forecast to dump a significant amount of rain on the farm. The storm stretches all the way down from the tropical north of the continent. It’s big and it has been raining here today (Monday) for most of the afternoon. The farm has no fences so the wildlife come and go as they please. It is hard to ignore some of the animals though like the ginormous wombat that the editor and I startled last evening. This wombat was so big, she didn’t run from us, but instead turned rapidly to face us, grunted an unmistakeable warning noise which roughly translated to: go somewhere else. At the same time the wombat stomped her large fury paws on the ground too. We wisely went somewhere else because she meant business! Sometimes though it is the smallest wildlife here that is the most endearing, as the editor spotted this little fella the other night sheltering on the trunk of a grey wormwood shrub. Speaking of shedding the past, I started dismantling the old chicken run this week. The shed won’t be demolished, but instead it will be modified and converted into a second fire wood shed over the next few weeks. Repurposing that chicken shed into a firewood shed, rather than demolishing it or even letting it fall into ruin, got me thinking about how people approach problems and challenges, and it seemed like a good metaphor for why we live here on this farm. However, before the shed conversion can be performed, there was the very big job of removing the welded mesh that covered the entire roof of the chicken run. I hadn’t realised just how many nails and steel ties I’d originally used until every single one of them had to be removed. There were hundreds of them! 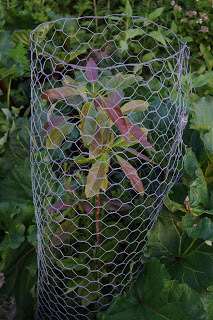 Eventually though the roofing mesh was completed and the welded mesh was neatly rolled up and stored for future use. Observant readers will note just how well the wheat is growing in the old chicken run! The new berry enclosure, which is also being used as temporary tomato beds, took a few more steps towards completion this week. 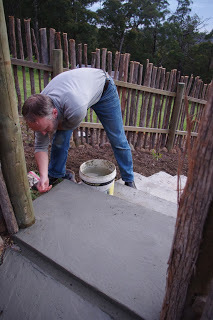 We started constructing the concrete stairs from the entrance and down into the less steep part of that berry enclosure. 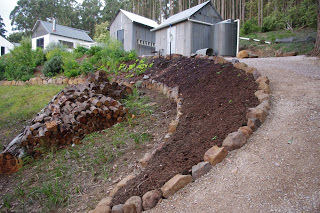 Also the previously clay pathways between the plant beds were covered in composted woody mulch (about 3 cubic metres worth or 3.3 cubic yards) to stop the ground from drying out over summer. You can even see in the photo below the many tomato seedlings adapting to their new home. Now, if it just stops raining for a little bit I’ll be able to continue that job! The extreme heat during October has had all sorts of weird impacts on the plants here and I noticed today that the Gooseberries are at least one month in advance of where I’d normally expect them to be. And the plant growth has gone completely feral. In the photo below, the path has turned into an impasse! 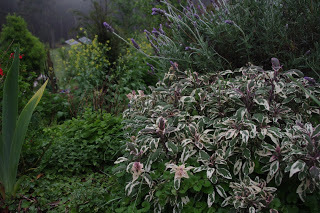 It is hard to imagine, but there are even more flowers on the farm this week! To combat the extreme heat and dry conditions, that I’m confronted with on the farm, I have planted a serious diversity of plants. 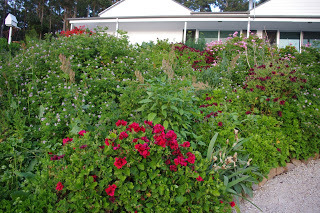 That diversity of plants is also planted so close together that the soil is rarely exposed to the harsh sunlight. In the close up photo below I can spot dozens of different plants and there is no soil exposed to the sunlight. I have not watered those plants at all during October either. 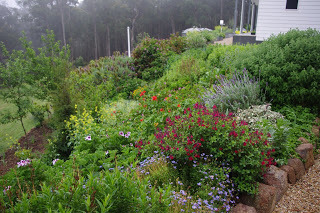 Despite the record breaking hot weather conditions of October on this continent, the garden continues to grow and thrive. Having lived through tough times, I know that we can adapt to them and thrive. However, having lived through tough times, I no longer believe people when they say there is no ghost to fear, because I have seen that ghost and I accept my fear of it. The temperature outside here at about 8.15pm is 7.4’C degrees Celsius (45.3’F). So far this year there has been 632.6mm (24.9 inches) of rainfall which is up from last week’s total 623.0mm (24.5 inches).